A federal court established a link between the Council on American Islamic Relations (CAIR) and the terrorist group Hamas, but that did not stop Chicago's ABC 7 joining Morgan Stanley and New York Life in co-sponsoring its Chicago chapter's March 15 banquet. An FBI agent testified that CAIR was a Hamas front group in the 2008 Holy Land Foundation terrorist money-laundering trial. It was listed as an unindicted co-conspirator in the same case. In a 2009 ruling, U.S. District Judge Jorge Solis wrote that the government's evidence delivered in the case creates "at least a prima facie (face value) case as to CAIR's involvement in a conspiracy to support Hamas." Questions about CAIR's Hamas ties led the FBI to break off official contact with the group in 2008. Its representatives have consistently claimed that the U.S. government frames terror suspects, defended Hamas and other terrorist groups against Israel, and told Muslims not to cooperate with the FBI. 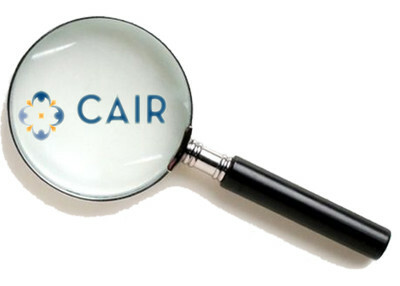 CAIR tries to censor any media critical of "militant Islam" and "Islamic terrorism," two terms that the group has tried to scrub from the American lexicon. It has even tried to censor prosecutors who use these terms. 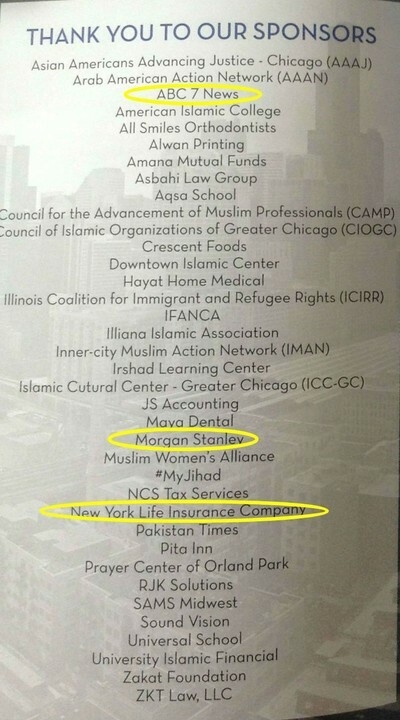 So it was surprising to see Chicago's ABC affiliate, Morgan Stanley and New York Life Insurance Company among the sponsors of the recent CAIR fundraiser. That a media outlet and established national financial institutions would sponsor an organization directly linked to Hamas and its censorship campaigns against human-rights activists who have decried attention given to "honor crimes" against Muslim women is curious to say the least. CAIR recently launched a censorship campaign against the documentary "The Honor Diaries," which featured Muslim women talking about the violence committed against Muslim women around the world merely because they had incurred the wrath of their husbands or brothers. It also recently pressured the ABC Family Channel into dropping a TV series about a young Muslim-American teenager held against her will in Saudi Arabia by her Muslim relatives and forced to conform to the severe restrictions imposed on women by Islam's Wahhabi sect. And last week, CAIR successfully forced Brandeis University into rescinding plans to award an honorary degree to former Muslim and human-rights advocate Ayaan Hirsi Ali. These campaigns demonstrate the true aim of CAIR: to erase from American culture, history and politics any reference to Islamic extremism. In light of CAIR's extremism, its defense of terrorist groups and its routine censorship campaigns, the participation of national financial institutions and corporations—New York Life and Morgan Stanley – and a media outlet – ABC 7 – only serves to legitimize an organization that is the Muslim equivalent of the Italian American Civil Rights League, which was a front for the Mafia. The station was a sponsor of the 2013 CAIR-Chicago banquet, too. Perhaps most disturbing is the apparent collusion between a news organization and a group whose sole goal is spreading propaganda; this should raise alarm bells among all who look to news organizations for unbiased, neutral coverage. ABC 7 and Morgan Stanley did not return the Investigative Project on Terrorism's multiple requests for comment; however, New York Life said on background that its corporate office had no record of having sponsored the CAIR event. The New York Life representative said it is possible that a local representative had made a "very small" donation had been made but no records existed at headquarters. CAIR has placed considerable effort into molding the news to censor perspectives it considers "Islamophobic," such as the mere mention of the term "radical Islam." "Media in the United States is very gullible," Sarwat Husain, vice chair of CAIR's national board of directors, said at a 2008 conference sponsored by the Islamic Society of North America (ISNA). Husain also noted that reporters will come running to CAIR and its aligned groups in the Muslim community when they need comments and that they should "take advantage of that." CAIR's national spokesman and chief propagandist Ibrahim Hooper told the Minneapolis Star-Tribune in 1993 that he "wouldn't want to create the impression that I wouldn't like the government of the United States to be Islamic sometime in the future." CAIR spends a considerable amount of time and money trying to manipulate and intimidate the media into promoting CAIR's agenda instead of the truth. It wants the media to parrot CAIR talking points because it means that the group can hide from statements and actions its officials have made in supporting the Palestinian terrorist group Hamas and suicide bombings. CAIR co-founder and Executive Director Nihad Awad participated in a secret meeting of Hamas leaders and supporters in the U.S. in 1993 to plan a campaign of deception among the American public to soften the image of Hamas. Six months later, on March 22, 1994, at Barry University, Awad openly expressed his support for Hamas. "I used to support the PLO, and I used to be the President of the General Union of Palestine Students which is part of the PLO here in the United States, but after I researched the situation inside Palestine and outside, I am in support of the Hamas movement more than the PLO." He continued his defense of Hamas and other Palestinian terrorist groups a decade later when he accused CAIR's critics of spreading "an Israeli viewpoint" during a 2004 interview with Al-Jazeera. He referred to Hamas and other Palestinian terrorist groups, as well as Hizballah, as "liberation movements." "I truly do not condemn these organizations," Awad said. "I will condemn them only when I see that media outlets are requiring the heads of Jewish foundations in America to condemn Israel for its treatment of innocent people; for killing people whether in Lebanon, Qana, or Palestine; for bulldozing their homes; and for their flagrant human rights violations. "We do not and will not condemn any liberation movement inside Palestine or Lebanon." Awad's name also appeared in a phone book of members of the Muslim Brotherhood's Palestine Committee, which worked covertly to support Hamas. "CAIR is a group, which seeks to not enlighten, but control news coverage," said Tucker Carlson, editor in chief of the Daily Caller. "It doesn't mean that you can't call CAIR on the phone for comment. You ought to," Carlson continued. "They have a point of view that I think should be represented, but to co-sponsor an event with them suggests a level of collusion that it wrong for a news organization. "Would the station co-sponsor an event with AIPAC (The American Israel Public Affairs Council) or how about with the Catholic Church? Of course not, and it shouldn't," Carlson continued. "I know they wouldn't, and why are they doing it with CAIR? I know the answer." Carlson has confronted CAIR in the past and says no group is automatically entitled to positive coverage. Instead of investigating CAIR, ABC 7 has parroted CAIR-Chicago's talking points about the past banquets the station co-sponsored on its website, such as promoting "A Future Without Bigotry" or about its banquet honoring civil rights. In one August 2011 report, ABC 7 uncritically covered CAIR-Chicago's attack on a coloring book that used the term "radical Islamic Muslim extremists" to describe the 9/11 hijackers. CAIR-Chicago spokeswoman Amina Shariff denounced the coloring book's description of the 9/11 cross as "a sign of hope," suggesting its author was "trying to imply subliminally some kind of Christian-Muslim conflict here, I think that that is very dangerous and completely inappropriate." The station quotes CAIR-Chicago's Executive Director Ahmed Rehab in a December 2012 story about its "MyJihad" campaign whitewashing the violent connotations of jihad, saying, ""Jihad in Islam simply means to struggle to a better place." No opposing view was presented in ABC 7's brief on the campaign. But had ABC 7 chosen to look deeper into Rehab's past statements and likes, not to mention CAIR's background, a very different picture emerges. If Rehab truly believes that jihad is not related to violence as he says, then he should explain his expressed admiration of Muslim Brotherhood ideologue Sayyid Qutb, who he listed as his "Favorite Modern Personality" next to Malcolm X. He notes that they were "martyred for what they stood for, same year!" Qutb was a Muslim Brotherhood leader executed in 1966 who explicitly called for violent jihad against infidels; his books are replete with massive anti-Semitic and anti-Christian dogma and conspiracies such as the Jews' control of world finance. Muhammad Qutb's most infamous follower was Osama bin Laden, the founder of al-Qaida. Bin Laden recommended that his followers read Muhammad Qutb's work in an Oct. 19, 2003 video. CAIR officials have staunchly defended the Holy Land Foundation. CAIR's Rehab, the emcee of the Chicago CAIR banquet, charged that the prosecution's case was not just aimed at HLF but "against the Muslim community" at a July 15, 2007 town hall meeting held by a group called Hungry for Justice. A federal appeals court upheld the HLF defendants' convictions on all counts in 2011. CAIR's activities since its creation in 1994, as documented in the IPT's dossier on the group, show it is an extremist group that has never missed an opportunity to obfuscate the threat from Islamic extremists in the United States. Its rationalization of terrorist acts and its defense of convicted Islamic terrorists are not secret and are too numerous to cite. That is why the banquet sponsorship by Chicago's ABC7, Morgan Stanley and New York Life is so troubling. Their sponsorship of a group that is a front for Hamas only demonstrates the frightening success of CAIR's meticulous campaign of deception in hiding under the false veneer of being a "civil rights group." A Google search would have easily pointed to the multiplicity of publicly available evidence of CAIR's ties to Hamas and its defense of terrorists. Whether by intimidation or manipulation, these sponsoring organizations have only served to legitimize a true hate group. It's not against the law, however, to voice extremist views or to defend terrorists. But unless pressure is brought to bear on CAIR's sponsors, they will take the path of least resistance and continue their sponsorship of a Hamas front group. So if you want to help stop the legitimization of CAIR, then its sponsors need to hear from you. You can contact Chicago's WABC7 via the station's Vice President of Community Affairs Diana Palomar at diana.palomar@abc.com, on Twitter @ABC7Chicago, or by calling 312-750-7777. You can register your complaints with Morgan Stanley on Twitter @MorganStanley or at phone number 212-761-4000. Corporate support for CAIR gives the group undeserved legitimacy and is akin to supporting fronts for the KKK or other terrorist or criminal enterprises. It is time for the American public to stand up to CAIR's bullying and infiltration into the halls of power such as the media, American corporations and the government. Have you looked recently at Robert Malley and what he is now doing? He is clearly advising John Kerry and the WH on the Hamas, PLO, Israel, Syria playbook. Even the Saudis are real worried about this guy. Thank you for this important article and the work that you do. It is sad to see corporations sell themselves out for an organization like CAIR that obviously does not value the United States constitution & the freedom it symbolizes for all. It is clear that CAIR is just part of a list of Islamic front groups that are trying to push for a future caliphate whereby Islam rules over all. This is there real objective. If we Americans ignore it now it will only be a matter of time they will have entrenched themselves in our legal system as in our court rooms as judges & lawyers. In fact, this is already happening. As I have said before what is happening in the US now is exactly how the take over of Europe was started. They were allowed to immigrate to the countries and once they get there they begin to produce the large families they can't support which the tax payers then are forced to take on that expense. They are finishing off Europe by the numbers and that is what they have up their sleeve for the US and with these US corporations backing Cair and boot licking these terrorists it just goes to show you just how low these corporations have dropped.